GMO scarecrow is a rhyme, so it must be true. There is also a reasonable relation between GMO and scarecrow, even though they are rooted in different fields of sentiment and sentimentality, so the figure is quite stable. But the whole global situation is unstable and the tired alertness gnaws at our bones. 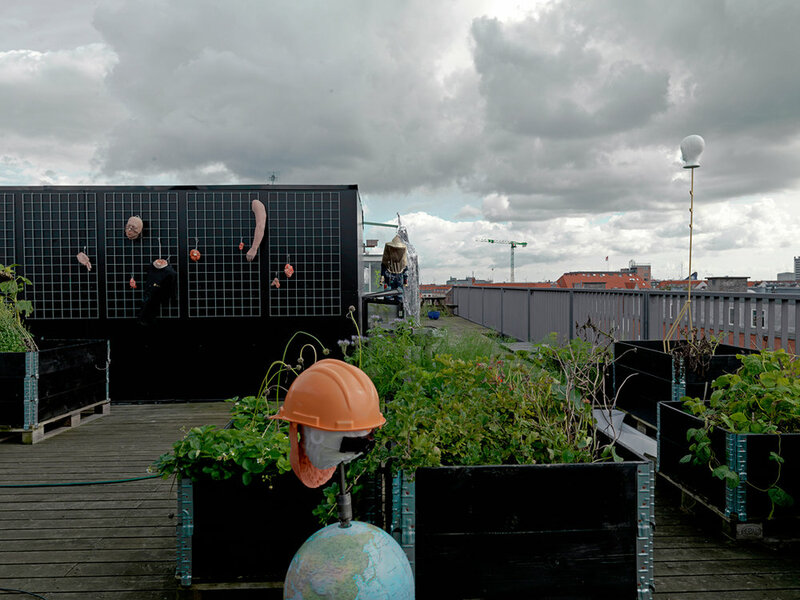 As a symbol of protection from the feeling of multiple threats, we will gather an array of scarecrows, in the shape of contemporary figurative artistic presences, at Age of Aquarius’ rooftop garden in Copenhagen; talisman-men-and-women for a household. Diagrammatic bones with dramatic flesh. A finger, an arm, a body, pointing at the sun, swaying in the wind. Age of Aquarius, Paul Barsch, Alfred Boman, Heath Bunting, Frederik Exner Carstens, Kapper Creations, Henrik Plenge Jakobsen, Christian Jeppsson, Mathias & Mathias, Kim Richard Adler Mejdahl, Rolf Nowotny & Uma Vinterbarn Nowotny, Aniara Omann, Ivan Pérard, Asbjørn Skou. 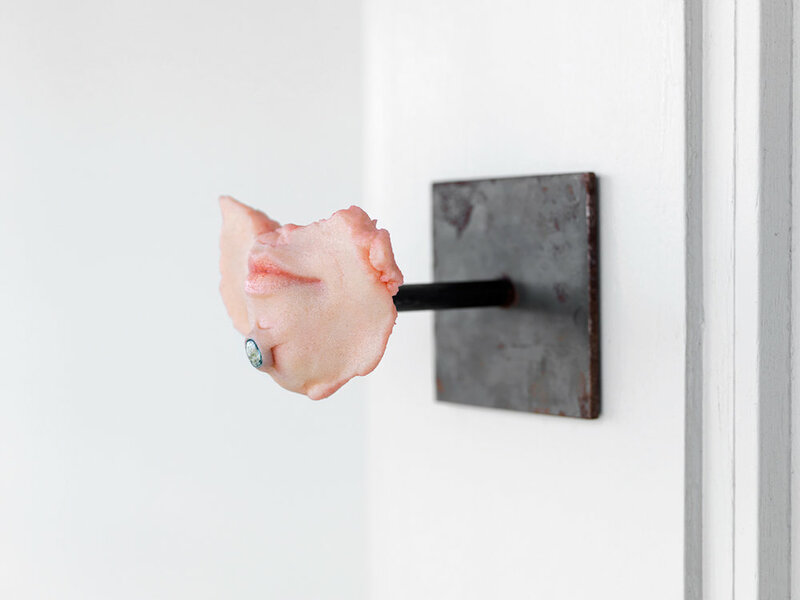 Frederik Exner Carstens, Dæmon, 2017 (Silicone, plexiglass, screen print, burned clay). Photo: ARTEFACT1.NET & Age of Aquarius. Aniara Omann, Home is where the heart is (Mouth), 2017 (Cast silicone, PAX paint, polyester resin, metal display). Photo: ARTEFACT1.NET & Age of Aquarius. Aniara Omann, Home is where the heart is (Elbow), 2017 (Cast silicone, PAX paint, polyester resin, metal display). Photo: ARTEFACT1.NET & Age of Aquarius. Aniara Omann, Home is where the heart is (Foot), 2017 (Cast silicone, PAX paint, polyester resin, metal display). Photo: ARTEFACT1.NET & Age of Aquarius. Paul Barsch, Chickencooler, 2017 (Video on phone, 01:29 loop). Photo: ARTEFACT1.NET & Age of Aquarius. Asbjørn Skou, Board meeting (a sad day for investors), 2017 (Self-hardening clay, snail shells, acrylic medium). Photo: ARTEFACT1.NET & Age of Aquarius. Alfred Boman, Untitled, 2017 (Iron, hard hat, globes, self-hardening clay, acrylic paint). Photo: ARTEFACT1.NET & Age of Aquarius. Kapper Creations, Props (Various materials and year). Photo: ARTEFACT1.NET & Age of Aquarius. Rolf Nowotny & Uma Vinterbarn Nowotny, The Dead (kreatur) The Living, 2017 (Welded iron, enamal paint, crayon on styrofoam). Photo: ARTEFACT1.NET & Age of Aquarius. Paul Barsch, The wooden clogs ended up in smoke, 2017 (Burned clay, hydrographic print). Photo: ARTEFACT1.NET & Age of Aquarius. 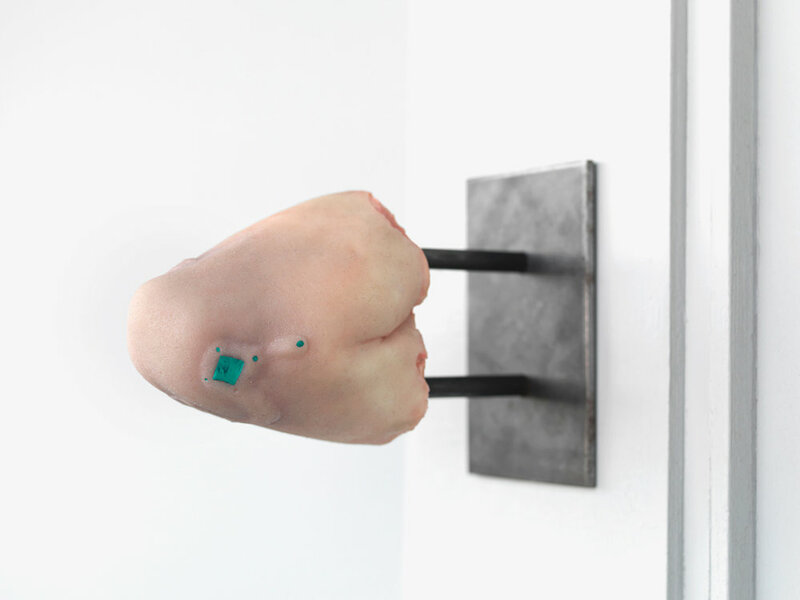 Ivan Pérard, Mixed Signals, 2017 (Animation, 0:00:08.08 loop). Photo: ARTEFACT1.NET & Age of Aquarius. Kim Richard Adler Mejdahl, Demonic Monologue, 2016 (Video on screen, 04:37 loop). Photo: ARTEFACT1.NET & Age of Aquarius. Age of Aquarius, Bi-høn, 2016 (Chicken wire, straw hat, fabrics, transfer prints, badges, embroidery). Photo: ARTEFACT1.NET & Age of Aquarius. Mathias & Mathias, Gargoyle, 2017 (Unburned clay, paint, soil, sawdust, cosmetics, drain pipe). Photo: ARTEFACT1.NET & Age of Aquarius. Henrik Plenge Jakobsen, Freiheit ist ein Geheimnis, 2017 (Iron, chicken wire, plaster, plastic, spray paint, mylar foil). Photo: ARTEFACT1.NET & Age of Aquarius. Christian Jeppsson, Inner Garden, 2016 (Inkjet print on shrink wrap, round lightning fixture). Photo: ARTEFACT1.NET & Age of Aquarius. Heath Bunting (curated by Jacob Lillemose), Natural Reality SuperWeed kit 1.0, 1999 (Plastic bag, seeds, instruction, foil, Posca ink). Photo: ARTEFACT1.NET & Age of Aquarius. from the 15th-22nd of September 2017. Age of Aquarius is a collaboration between artists Nanna Starck and Uffe Isolotto, and manifests itself as both a curatorial exhibition and event platform in a rooftop garden in Copenhagen, and as an internationally exhibiting collaborative. The thematic base for all of Age of Aquarius’ activities is the garden cycle, and the curating and the artworks reflect the pragmatics of the garden. Because of the nature of the space - an intimate open air venue overlooking the Copenhagen skyline in a public health center with private penthouse apartments - notions of private and public space are part of the curating and experience of the artworks. The focus is mainly on intimate experiences through sculptures, performance, sound and video. Age of Aquarius has contributed to idoart.dk since 2017.